Seek, Test, and Treat: Addressing HIV in the Criminal Justice System. 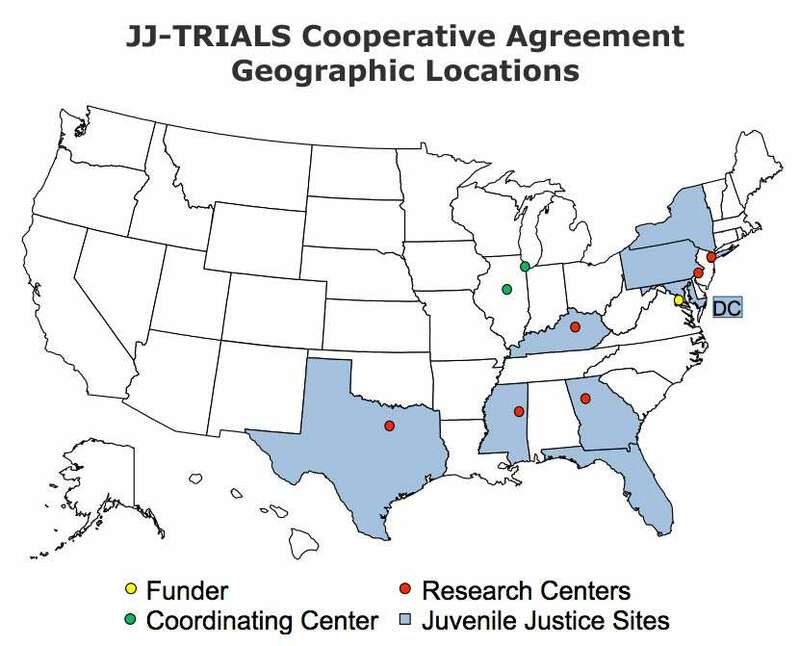 NIDA’s Juvenile Justice Translational Research on Interventions for Adolescents in the Legal System (JJ-TRIALS) is a multisite cooperative agreement that launched in 2013. JJ-TRIALS is a seven-site cooperative research program designed to identify and test strategies for improving the delivery of evidence-based substance abuse and HIV prevention and treatment services for justice-involved youth. Virtually all justice-involved youth could benefit from HIV and substance abuse prevention and/or treatment interventions. Many evidence-based interventions targeting adolescent substance abuse and HIV screening, assessment, prevention, and treatment currently exist. Unfortunately, implementation of these interventions within juvenile justice settings is variable, incomplete, and non-systematic at best. A longitudinal, nationally representative survey of juvenile justice community supervision agencies about policies and practices related to substance use assessment and service delivery. National survey data was collected in 2014 and 2017. In addition to community supervision agencies, the national survey also collected supplemental data from the perspective of juvenile justice judges and behavioral health agencies that work with justice involved youth in the surveyed communities. Findings from the 2014 survey are expected to be published in late 2017 or early 2018. A 36-site cluster-randomized control trial (RCT) comparing different approaches to systems improvements efforts aimed at improving the identification of substance abuse service needs among justice involved youth and delivery of services to address those needs. Juvenile justice sites participating in this study partner with local behavioral health agencies to set tailored goals around how to reduce unmet needs for justice involved youth. This RCT is guided by an implementation science framework and will answer questions around which elements of an implementation interventions lead to the most changes in unmet service needs. A 6-site pilot trial examines the degree to which the model developed in the 36-site RCT can be adapted to meet unmet needs around STI/HIV risk behaviors and service needs for justice involved youth. Seven research centers were funded as part of the JJ-TRIALS collaborative: Chestnut Health Systems (PIs: Michael Dennis and Christy Scott), Columbia University (PI: Gail Wasserman), Emory University (PIs: Ralph DiClemente and Gene Brody), Mississippi State University (PI: Angela Robertson), Temple University (PI: Steven Belenko), Texas Christian University (PI: Danica Knight), and the University of Kentucky (PI: Carl Leukefeld). JJ-TRIALS is funded by the National Institute on Drug Abuse, located in Bethesda, MD. The seven research centers funded as part of the JJ-TRIALS collaborative include Chestnut Health Systems (located in Chicago, IL and Bloomington, IL), Columbia University (in New York City, NY), Emory University (in Atlanta, GA), Mississippi State University (in Missisippi State, MS), Temple University (in Philadelphia, PA), Texas Christian University (in Fort Worth, TX), and the University of Kentucky (in Lexington, KY). Sites that will participate in the JJ-TRIALS initiative are located in Florida, Georgia, Kentucky, Mississippi, New York, Texas, Pennsylvania, and Washington, DC. Questions about JJ-TRIALS can be addressed to Tisha Wiley. CJ-DATS was designed to identify ways in which these offenders could benefit from the continuum of effective substance abuse treatment services. CJ-DATS tested several strategies for improving drug abuse treatment services through the coordination with criminal justice assessment, monitoring, and supervision activities. Further, the CJ-DATS initiatives were designed to inform the development of models for integrating evidence based substance abuse treatment with the criminal justice system. More information on CJ-DATS can be found on our Archive site. The Seek, Test, and Treat: Addressing HIV in the Criminal Justice System (STTR-CJ) funds twelve R01 applications that empirically test the “seek, test, treat, and retain” paradigm with drug abusers in criminal justice populations. Researchers are developing, implementing, and testing strategies to increase HIV testing and the provision of HAART to HIV seropositive individuals involved with the criminal justice system, with particular focus on continuity of HAART during and after community re-entry following incarceration.